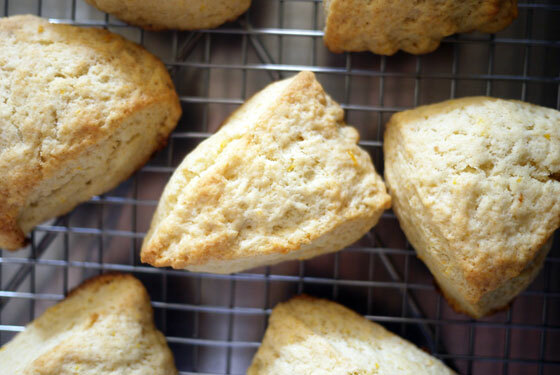 Makes 6-8 scones, depending on size. Make a depression in the center of the dry ingredients and pour the cream into it, and stir together. Do not overmix; the mixture should be somewhat lumpy but should hold together. Turn the dough onto a floured board, and fold it several times. Do not knead. Form it into a round patty about 3/4″ thick. It can be thicker in the middle. Use a knife to cut the dough into sections like a pie. Place each section on a greased baking sheet with at least 1 1/2″ of space between each section. Bake for about 6 minutes, then, if using egg/milk/cream glaze, remove and brush the tops with your glaze of choice. If using coarse sugar, sprinkle it over the tops after glazing. 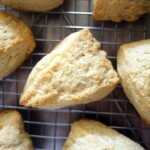 Return to oven to finish baking until the scones are puffed up and golden around the edges. Fresh, frozen, or dried berries or fruit (cut into chunks) or nuts, or even chunks of chocolate can be folded into the dough during step 4 in the directions for interesting flavor variations. Use about 1/2 to 3/4 cup total of whatever you’re adding. Alternately, you may divide the dough into two halves, and make thinner circular patties out of each half, then spread fruit preserves or fresh fruit as a layer in between the two halves. Turn the dough onto a floured board, and fold it several times. Do not knead. Form it into a round patty about 3/4" thick. It can be thicker in the middle. Place each section on a greased baking sheet with at least 1 1/2" of space between each section. Fresh, frozen, or dried berries or fruit (cut into chunks) or nuts, or even chunks of chocolate can be folded into the dough during step 4 in the directions for interesting flavor variations. Use about 1/2 to 3/4 cup total of whatever you're adding. Alternately, you may divide the dough into two halves, and make thinner circular patties out of each half, then spread fruit preserves or fresh fruit as a layer in between the two halves.